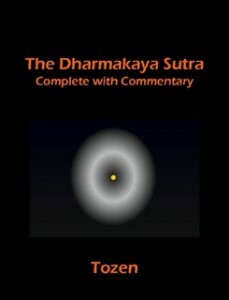 The author: Fluent in several languages, Tozen presently resides in Sweden and established Fifteen years ago the Zen school of the Unborn Mind, a virtual sangha of genuine spirituality. Tozen’s aim in the formation of this school is to provide a safe haven for some few good dharma seeds to grow amidst the present darkness of this age; according to Tozen, during this age the true buddhadharma will be as rare as a flower atop a great snow-filled mountain and the false paths of Mara are as dangerous as the vast sand dunes of the Sahara desert–beautiful and inviting at first, but full of death traps once one becomes lost without a skillful guide. His pinnacle work, The Dharmakaya Sutra, is a real authentic breakthrough in genuine mystical zen buddhism.